And we danced and danced and danced. It’s winter in New Zealand. In July. I’m used to July being a fun month, it's not here. So what’s a gal to do? Think outside the box a little. So that's just what I did this weekend. 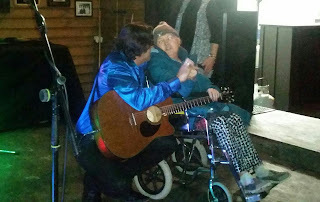 I found a Neil Diamond impersonator who was playing a show way out in the sticks. I was sold!! But that’s not the most interesting part of the story. Just after a glorious version of “Coming to America,” a little lady wandered up to the singer and whispered something into his ear. She gestured towards her friend, who was in a wheelchair, and the singer nodded. A moment later the singer belted into “Sweet Caroline” and the little lady pushed her friend onto the dance floor. She loved Neil Diamond and had loved to dance as a healthier woman, and wanted another tour of the dance floor. And then the nicest thing happened. The crowd, who hadn’t had quite enough alcohol to dance, all almost simultaneously joined her on the dance floor. Her face lit up into a huge smile and the singer eventually brought her up on the stage with him. Here is a picture of that moment. It reminded me of what an extraordinary thing it is to dance. When I was younger I was “too cool” to dance and would hover around the back and look on in judgment. There’s always a guy like that at every party. Don’t be him. 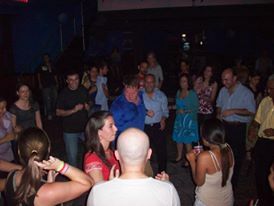 Nowadays, I’m often one of the first people on the dance floor. I don’t care if I look stupid. A part of me even knows I do. But who cares?? The music (and let’s be honest, the beer) moves me to express myself. So later on, I had the privilege of sharing a dance with the lady in question. It reminded me to dance while I still can. One day my legs won’t work anymore, I’ll grow old, and I’ll have nothing but memories. So tonight I decided to make another one. So for everyone out there that’s “too cool,” I urge you to rethink your position. Dance like no one is watching. If you can master that, you’re winning at life, I promise you. So I will close with a little picture of me in Costa Rica. Me in all my sweaty, non-Spanish speaking glory. I made a lot of new friends that night.. Despite not knowing the language. Music and dancing are universal languages that break down barriers of culture, class, language, and age. And if you’re ever in New Zealand in July, give me a ring.. I just might take you on a tour of the dance floor to Sweet Caroline.